When your out of chalk paint! 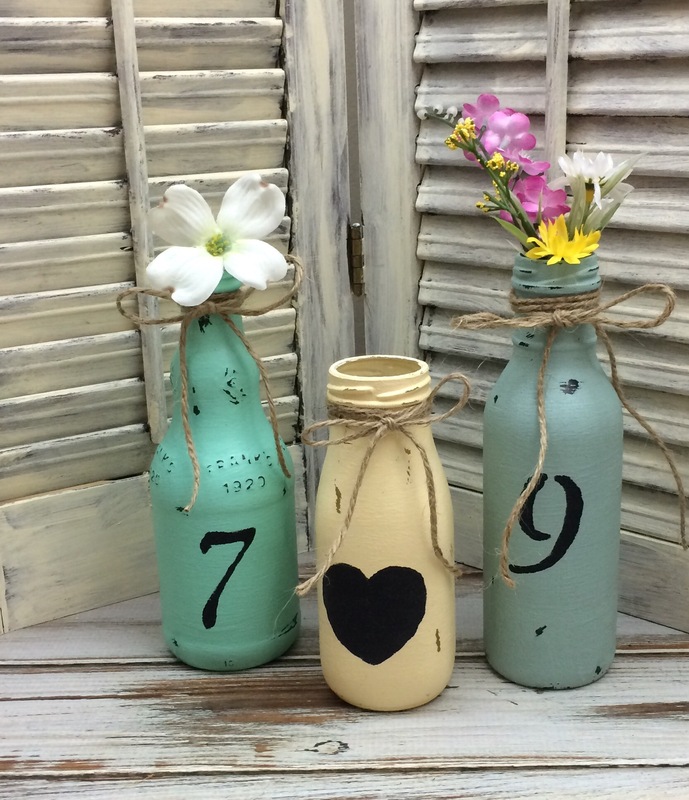 No problem, you can make your own homemade chalk paint like I did for these cute bottles and tin cans. You can make your own chalk paint in whatever color you desire with one ingredient found in most households. Recently I ran across some bottles/jars over at “Ragged Bits” and fell in love with them, and had to make my own. One problem, I didn’t have any chalk paint in the colors that I wanted. If you’ve bought chalk paint before then you know it’s pretty expensive. So I compromised and made my own homemade chalk paint, this way I can make it in whatever color that I want. I seen a recipe on Pinterest for homemade chalk paint a while back where the crafter used something most people already have stocked in their kitchen, baking soda (affiliate). So I played around with it till I got the consistency I was looking for, which came out to about 2 tablespoons of acrylic paint, and 1 teaspoon of baking soda, mix well. I just mixed a little bit because each bottle was going to be a different color, and I didn’t want any leftover. Each bottle recieved two coats of paint, and once dry I lightly sanded the bottles and cans to give them a worn look, then I stenciled my numbers and heart on. I then added a coat of Mod Podge (affiliate) for protection, and when that dried I added a piece of jute around the top of each bottle and can. 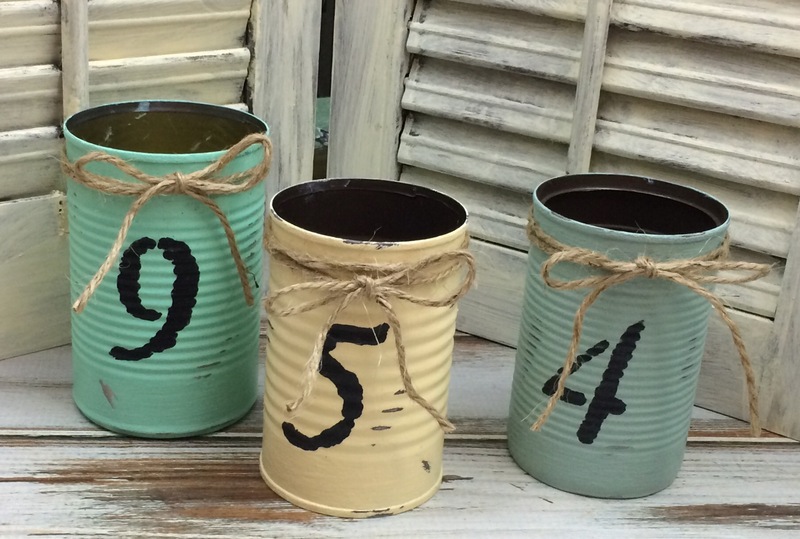 I love how my homemade chalk paint bottles and cans turned out. 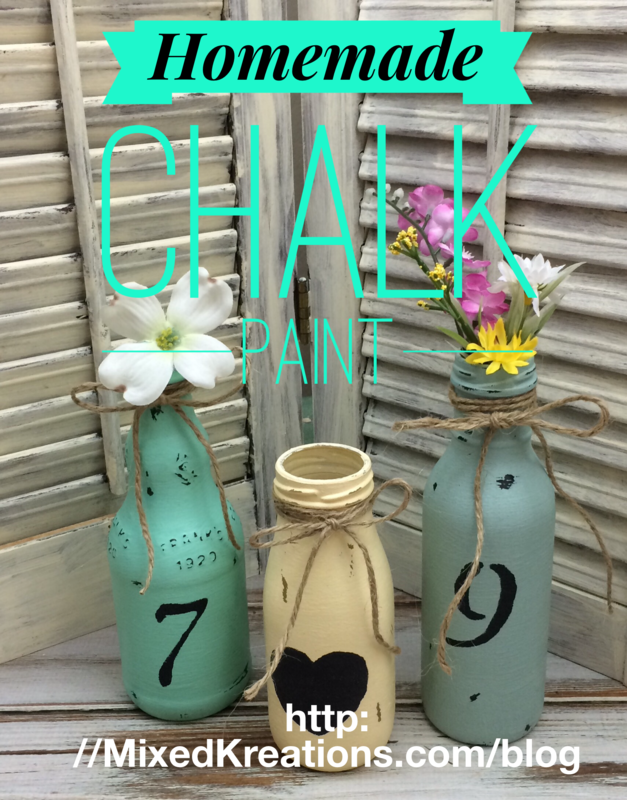 Do you have a homemade chalk paint recipe? I have found any plaster of Paris. Thought for sure Hobby Lobby would sell it. But mine said they no longer carried it. Then I ran across a recipe using baking soda. Works for me and it’s cheap. Thanks for stopping by! What a great post! Thanks, I will be trying this. I have wanted to use chalk paint but didn’t like the price to this is a very timely post! Thanks Kathy! I hope that you find it works as well for you as it did for me. I made my chalk paint with left over drywall mud and latex wall paint, which worked. I’m going to have to do a comparison. Cool! I think we have some drywall mud. I will have to give that a try too. Thanks for stopping by! I use Plaster of Paris but I will have to try this recipe for sure! Hi Renee! I couldn’t find any plaster of paris when I went looking for it. My hobby lobby no longer carries it. So when I ran across this recipe I tried it and it worked well for me. Thanks for stopping by! This is great! I can think of a few places I’d like to use chalk paint….thanks! Thanks Evelyne! I love chalk paint it sticks to about everything. You just got to make sure each coat dries throughly. Ooooo i will have to give this a go! I love chalk paint but it is so pricey. Thanks for sharing! I know what you mean, so I was so happy when I found out that I could use baking soda to make my own. Worked great. You will just have to experiment to get it the texture you want, but be sure to let each coat dry throughly. Thanks for stopping by! This is so cool! I have heard of plaster of paris and so I was a bit off put, I’m scared to mess it up, but this sounds right up my alley. 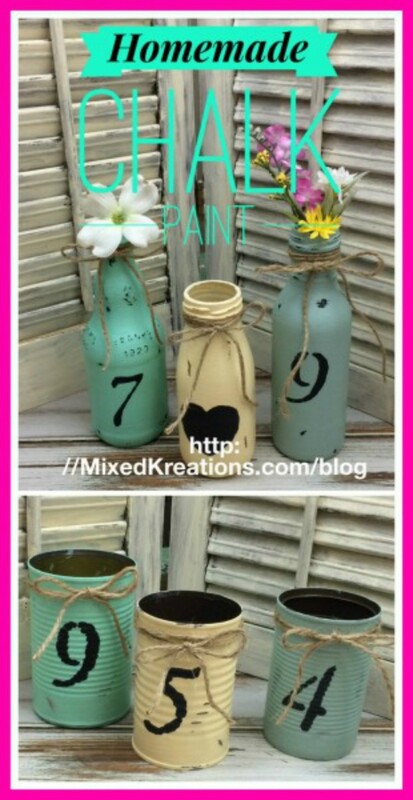 I have tons of craft paint, I’m going to have to give this a go, obviously it adhered to your bottles well, and they turned out adorable! I love them! Nikki Frank-Hamilton recently posted…#WAYWOW 28! You All Are Great! I was going to try the plaster of Paris buy couldn’t find any. Hobby Lobby said they quit caring it. So I went to my friend Google (-; and found out about using baking soda and gave it a try. Worked like a charm and less expensive. Thanks Mila! It is cheaper to make your own. And the baking soda works great. 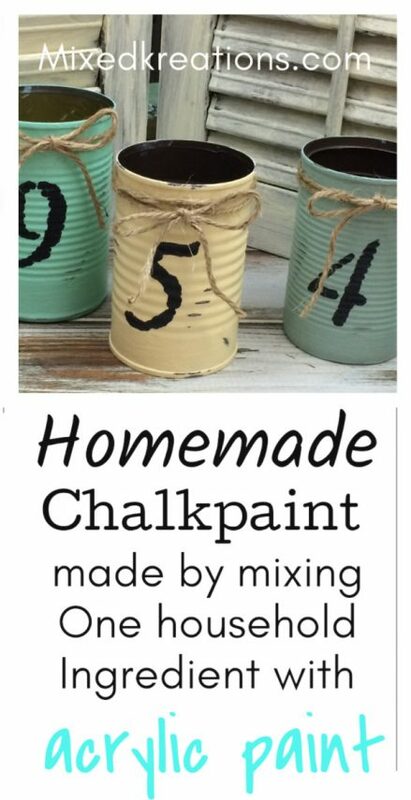 Never thought of using chalk paint but what a great idea! 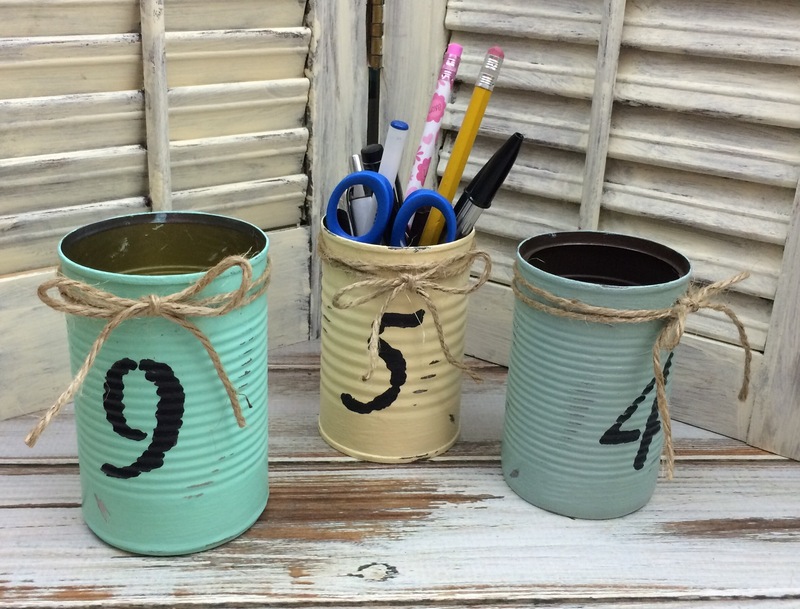 I love how you stenciled numbers onto them! Lovely project! I pinned your entries! Thank you so much for sharing at my craft party on Thursday! Would love to see your newest posts this week, which starts at 7pm EST. I love chalk paint! It sticks to about anything and is easy to distress. I will be there, Thanks! Thanks Sam, and Thank you for inspiring me to try the chalk paint bottles myself. I love how they turned out! can u use this on bigger furnatures? Hi Scarlett! I’ve never tried it on furniture just on my craft projects.